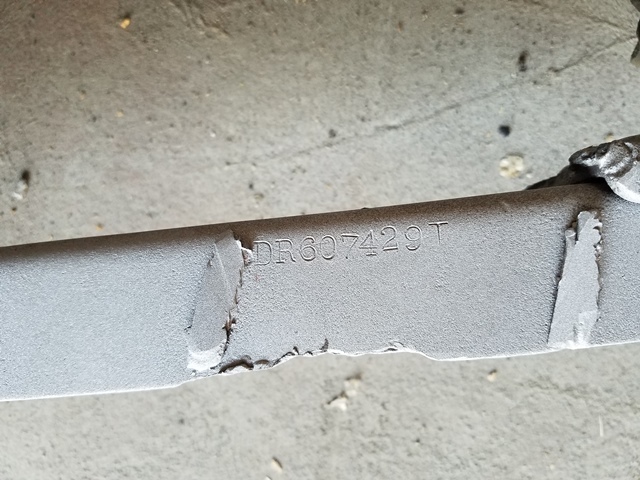 I have a 1946 TC-3 -- VIN DR607429T found on the trailer tongue after sandblasting and cutting off trailer jack. 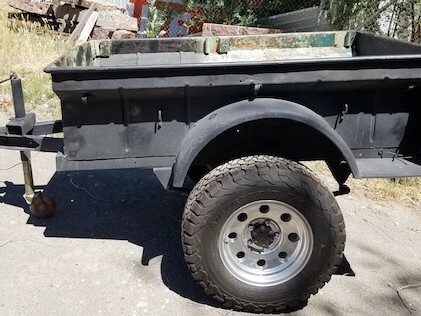 The trailer currently has 30" tires and 8" rims and is jacked up (axle under springs) -- which makes the trailer unstable and the tires are to large to drop it. So, I want to replace the wheels (rims & tires). Trying to figure out what fits (any CJ2A rim, willys combat rim?) and source for getting at least the rims. I did try rims from a 1960s M101 but they were to small (rims didn't fit the axle hubs). It is my understanding that these trailers used standard jeep wheels, i.e. 16 x 4.5. The hub should be and exact swap out for jeeps (including bearings and seals) and the wheels will fit over them. I am not familiar with the number you uncovered as the trailer's Serial Number should be on a plate attached to the outside left of the front panel. Thanks Rus ... http://bantamt3c.com/ is great resource. Agree the VIN stamp is in a strange location. The early T3-Cs were apparently pretty erratic on VIN placement (or even including it at all). But the format matches and the trailer design is consistent with 1946 numbering. It's possible the plate got removed -- will probably have a new one made just to support the bantamt3c site at a minimum. Your trailer's VIN looks like an assigned VIN from some state's Dept. of Revenue (DR), which often licenses motor vehicles and plain vehicles like your trailer (T). If at some time during its life, your Bantam trailer lost its original data plate (on which was stamped its original serial number), then upon not finding any serial number during an inspection, and upon application, a state may issue a made-up VIN number for a vehicle or motor vehicle that lost its original serial number or VIN so it can be titled and licensed. I imagine that is what happened to your trailer. If you have a title certificate or registration for this trailer, either should list this fabricated state-issued VIN as the trailer's VIN. Check them out and let us know what you find. ...these trailers used standard jeep wheels, i.e. 16 x 4.5. 4.5 is too new its actual 16 x 5 1/2 like the other CJ-2, 3, 5, 6 and 7s bolt pattern but 2A rims would be the period correct wheel. Combats if its a 45 or early 46. Might check with Harry Sheets midwestwillys.com on a pair of good used ones. I'm wondering if you're referencing the physical outside dimensions. I know the jeep Parts Manual (PM) and the Service Manual (SM) both list 16 x 4.5 (standard) and 15 x 4.5 (optional) as wheel sizes. That's measured from where the bead sits as opposed to the outer edge of the lip. If measured from the outside edges, I believe you do get 5.5 wide but you'd also get 17" diameter as well. It's interesting to note that the TM-10-1281 for the T3 lists a combat rim dimension as 16 x 4.5. My disclaimer: I don't know everything and have at times been wrong, but this is all I've had to go on. Perhaps at some point a wider rim was swapped in as standard equipment. On my trailer, I'm nowhere near the point of breaking down the originals to see what's stamped but assumed they are 16 x 4.5. Yes, my apologies...I was talking bolt pattern not width. Ahh! Very good catch! I missed it too!